Huntsville Hospital offers the MAKOplasty® joint replacement system. 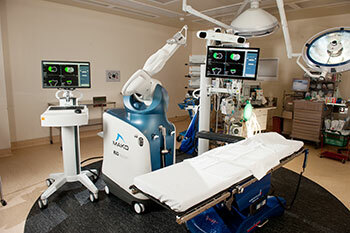 The procedures are less invasive than traditional joint replacement surgery and are performed using RIO®, a highly advanced, surgeon-controlled robotic arm system. The RIO® system provides a 3-D image of the patient's hips or knees based on a previous CT scan. Using the 3-D model, the surgeon can plan the most favorable size and position of the implant, which is critical for proper joint reconstruction. The system offers different advantages for knee and hip replacement patients. As an alternative to total knee replacement, Partial Knee Resurfacing is designed to relieve pain caused by joint degeneration due to osteoarthritis. The robotic arm gives the surgeon the ability to target a specific compartment of the knee while sparing the healthy bone and ligaments surrounding it. Since healthy bone is preserved with the partial replacement, a patient who undergoes this procedure may be a future candidate for a total knee replacement procedure. MAKOplasty® Total Hip Arthroplasty is another option for a total hip replacement procedure designed for patients who suffer from non-inflammatory or inflammatory degenerative joint disease. MAKOplasty® Hip assists surgeons in achieving accurate alignment and positioning of implants, restore patient confidence in their mobility, and help them return to an active lifestyle. Speak with your physician if you would like to learn more about this option.